Well done on getting so much rightly deserved positive feedback on a very enjoyable to read BTB. Also well done on having nearly 60,000 views. That's because your btb keeps bringing people like me back to see the next installment or drift back to see some other shows, you put together on this btb show. I even liked the recent Rhyno vs Lesnar match, don't recall ever seeing them face off before. The booking is top notch, feuds entertaining & some so good end up being divided on who I want to see win. All in all, wanted to say well done & thanks for producing enjoyable show to follow regularly. WCW World Title Match.....Brock Lesnar Defends Against ??????? WCW World Tag Team Title Match.....Chris Benoit & Chris Hero Defend vs ???????? WCW TV Title Match.....Daniels Defends Against ??????????? Last edited by TCON; 12-12-2018 at 03:06 PM. WCW World Tag Team Title Match.....Chris Hero & Chris Benoit Defend Against ?????? 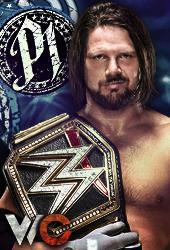 US Title Match.....CM Punk Defends Against ?????? Last edited by TCON; 01-11-2019 at 12:11 PM. WCW World Title Open Challenge Match.....Goldberg vs ???? ?